The chemical industry in Saxony-Anhalt is one of the most competitive in the world. The long-standing locations for the chemical industry in the federal state form the centre of the Central German Chemical Triangle. At the heart of things at Bitterfeld-Wolfen Chemical Park is the “nerve centre” of 4chiral, a unique network of producers of speciality and fine chemicals and scientific institutes from all over Eastern Germany. With the motto "Our Core Competence is Fine Organic Synthesis", the 4chiral network has been carrying out joint research and development projects in the area of organic syntheses since 2006. "The network largely consists of small and medium-sized businesses in the fine and speciality chemicals sector, supplemented by synthesis-oriented research facilities in the new federal states that make up Eastern Germany. Together, they have a considerable economic clout and offer a significant degree of innovation," explains Dr. Oliver Seidelmann, spokesman for the network and managing director of ChiroBlock GmbH in Bitterfeld-Wolfen. Together, the businesses in the network also offer knowledge-based solutions, processes, consulting services as well as the production of sophisticated fine- and speciality chemicals. A key focus of their work is on pharmaceutically relevant intermediate products and active agents. “4chiral is uniquely positioned for the task of producing any new molecule on any scale in a manageable time-frame and at a competitive price," highlights Oliver Seidelmann. Thanks to the autonomy of the members, the exceptionally unbureaucratic and streamlined organisation of the network, and due to the high degree of specialisation of the individual businesses and institutes, the network is able to handle a variety of different issues and orders in the field of substance conversion processes successfully, with flexibility and with a high degree of customer benefit. "A cluster of this kind is unique in Germany. There are two or three similar regional chemical networks in other regions of Europe. They are less broadly based than 4Chiral, however. Historically, the synthesis of what are referred to as chiral compounds has been the main focus of the cluster. Today, however, its services encompass the full range of substance conversion processes surrounding fine and speciality chemicals as well as biotechnology. The 4chiral network was founded by seven businesses from Bitterfeld-Wolfen Chemical Park, and has expanded to now encompass 40 members and partners throughout Eastern Germany, including nine universities, colleges and institutes. The partners meet at annual meetings and, in particular, at the many joint projects. The companies ORGANICA Feinchemie GmbH Wolfen and SYNTHON Chemicals GmbH & Co. KG from Bitterfeld-Wolfen are examples of businesses that cooperate in the network. ORGANICA, which is currently responsible for coordinating the network, is one of the biggest companies in 4Chiral. "In 2017, we sold approximately 300 tonnes of chemicals to more than 200 customers in 35 different countries. ORGANICA offers custom syntheses of high quality fine chemicals for a wide range of applications. One of our three mainstays are the pharmaceutical precursors which eventually become medical drugs," explains Dr. Jörg Blumhoff, managing director of the company that was founded in 1995 and now counts more than 90 employees. The network partner SYNTHON Chemicals, a manufacturer of speciality and fine chemicals established in 1991, also in Wolfen, currently has 35 employees. The chemicals experts and technicians at the company have been specialising on the production of fine chemicals for medical products for several years, including dyes for diagnostics, for example, but also photo-initiators. "SYNTHON covers the full range of synthesis at the gram scale and up to the 100-kilogram scale. If the volumes or quantities required by the customer exceed our manufacturing capacities, we are able to produce them at certain network partners, such as ORGANICA Feinchemie or Orgentis Chemicals," explains marketing manager Stephan Herre, citing an example of the cooperation. This would entail the transfer of methods of synthesis and analysis to the network partners on a confidential basis. 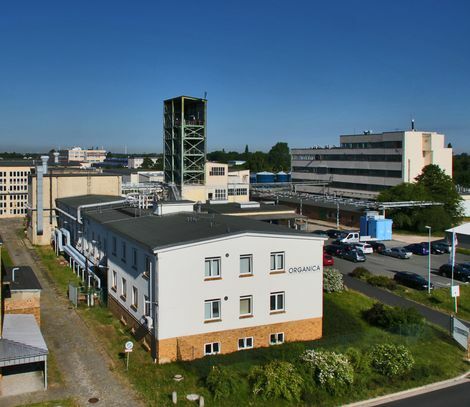 Orgentis Chemicals GmbH in Gatersleben is a founding member of the 4chiral network. Orgentis, which now has 15 employees, has been developing synthesis processes for specified target molecules and synthesizing a wide range of organic compounds according to customer request, since 1991. "The partners in the 4chiral network complement each other with their different areas of expertise, which means their technologies on the one hand and the scale of their equipment and systems on the other," explains the managing director of Orgentis, Dr. Hans-Matthias Vorbrodt. On the basis of the network, customers can therefore be offered the entire process chain – from the initial review of the literature, to the first laboratory tests, all the way through to large-scale production. All this basically takes place through the network and from one single source. "I have always been impressed by the positive attitude to new technologies in general and to fine chemicals here in Saxony-Anhalt, which applies to both the local people and the authorities concerned," says Vorbrodt. As a traditional industrial location with a long history in chemicals, the federal state of Saxony-Anhalt is an important location for fine chemicals in Germany, explains network spokesman Dr. med. Oliver Seidelmann. "The infrastructure at the chemical parks in the federal state is excellent and ideal for both the new chemical companies which want to locate here and existing businesses which want to expand." This is joined by its central location in Germany and Europe, its good transport links, its large pool of skilled workers and the density of the public R & D facilities that focus on "Chemicals, biochemicals, conversions and materials". In addition to this, with its innovation strategy, the government of the federal state of Saxony-Anhalt has explicitly recognized the value and potential of fine chemicals, a sector that it also supports with a wide range of funding instruments.